Boy oh boy, have we got something cooking in the kitchen for the Christmas weekend. 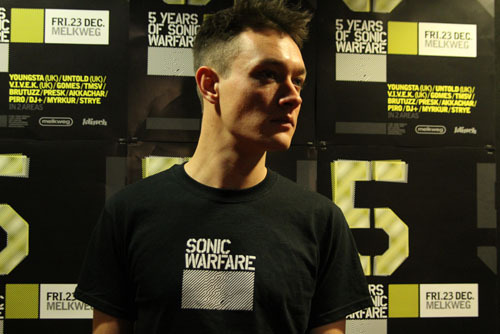 To start off with, the dubstep pioneers at Sonic Warfare will be taking over the Melkweg for what is going to be their 5 year anniversary party! Yes, it’s been five years of innovative and futuristic dubstep parties already. Who have they invited to come celebrate? Youngsta, Untold, V.I.V.E.K., Gomes, TMSV, Brutuzz, Presk, Akkachar, Piro, Myrkur, Strye and DJ+. Comment below this article on the Overdose.am Facebook page with a link to your favourite bass driven song. Winner announced on Friday! Ah good ol’ Marc Romboy, the man behind the contemporary house and techno label Systematic Recordings. If you’re a common visitor of this website, you might recall a really nice video interview we did with him a while ago. This time around, he won’t be headlining on his own though. French superstar DJ Technasia will also be present behind the decks for the night! Known for his famous sets in places like Ibiza this night can’t go wrong for the neutral house lover. Supporting the two headliners will be our local heroes Edwin Oosterwal and Mr. Jones. After all the forced family dinners and Christmas visits it’s time to blow off some steam at the Sugar Factory with a new Amsterdam minded party. The new concept will bring us both talents and renowned heroes from our city playing back2backs, extra long sets and some live acts. For this first edition, Anton Pieëte and Kabale und Liebe will do a 2,5 hour back2back set for the first time in their career. Next to them, our friends La Vondel (live), John Wolff and Prunk will be shining behind the decks. Go visit if you’re from Amsterdam and done with Christmas. At the ‘other’ square in Amsterdam, another party filled with local heroes and dump loads of live acts is taking place. I’m talking about 1001 Nacht, the traditional Boxing Day (2nd day of Christmas) party at techno temple Studio 80. Just have a look at the line-up: Quazar LIVE, Olene Kadar LIVE, Pitto LIVE, Efdé LIVE, Dorine Dorado, Frodo b2b Pep b2b David Reinhart and Tettero. Enough artists worth checking out for both DJ and live act lovers right? Go have fun and burn off those extra kilograms you put on during all those Turkey-eating-sessions. Finally, there is one more party on the ‘third’ day of Christmas I have to mention to you. This new yearly event is named The Circus of House and will be a modern day interpretation of the circus: a place where music, art and entertainment come together, but where the experience of the visitor remains central. 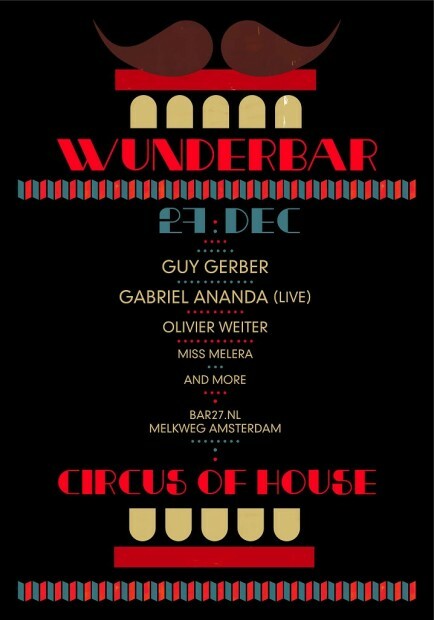 Wunderbar aims to be warm, cosy, extravagant and something people will want to relive over and over again. For the line-up, they’ve chosen artists that provide the perfect build-up and backdrop to this playground for house lovers like Guy Gerber, Gabriel Ananda, Olivier Weiter and Miss Melera.